With a newly developed digital load cell and an ultra-high speed processing module, high level precision of 0.08g (3σ)*1 has been realized. 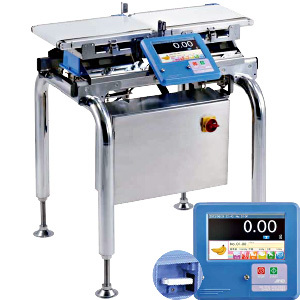 With this high accuracy checkweigher, you can minimize the giveaway of materials above the specified weight and contribute to reductions in production costs. *1 For AD-4961-2KD-2035. Depends on the shape and the condition of the product and installation environment. The display utilizes a high visibility touch panel color LCD with user friendly Graphic User Interface (audio guidance support function included). With its modular structure, the AD-4961 allows for rapid and simple installation or relocation. In the case of system shutdown, you do not need to wait for a service engineer to respond to the issue. Just simply replace the unresponsive module by yourself, so that you can shorten system downtime and maximize production efficiency.